The ReelBait ® Flasher Jig is the first and only neutral balanced jig on the market. 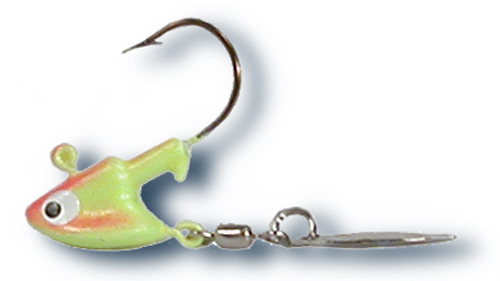 This unique head shape, hook placement, and tail assembly all combine to make this the ultimate jig. It will not roll over, it hangs horizontally, it acts as a stand up jig and is easily workable being cast, vertically jigged or trolled. The tail assembly creates maximum flash, distress vibration and sound patterns that trigger the instinctive command in a fish's brain to strike. 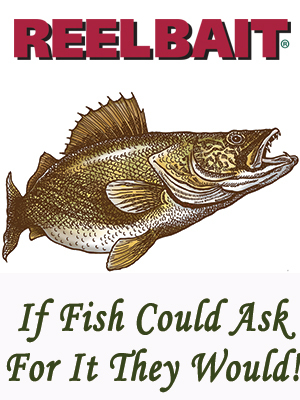 A proven jig for the broadest range of fish to be used on open water and under the ice. Extensively field tested and approved across North America. Designed to be used with traditional plastics or live bait. A true underwater chameleon, Flasher Jigs can be rip-jigged through weeds with a plastic body, jigged vertically in currents with a live shiner, or suspended under a bobber. Mustad Bronze Hook. Nickel Tail Assembly.